If you are a cookie dough lover, this is for you! It is basically safe to eat sugar cookie dough in frosting form and it's as good as it sounds! When it comes to cookies, the dough is often one of the best parts. So why not tweak the recipe a bit and turn it into frosting? 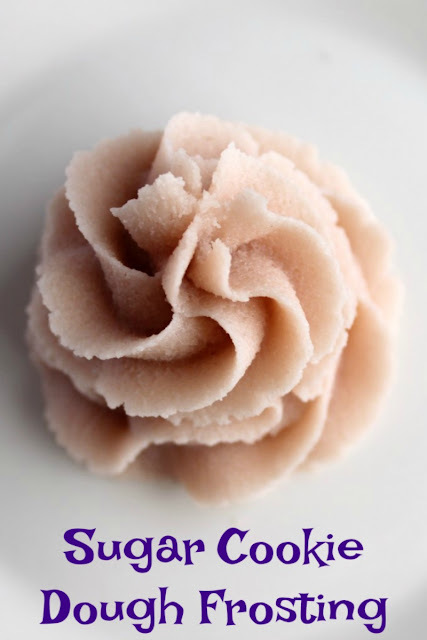 This sugar cookie dough frosting does just that! It's egg free and super delicious, plus you can use it to decorate cakes and cupcakes! I think by now we all know that playing with different frosting recipes is one of my favorite things to do. 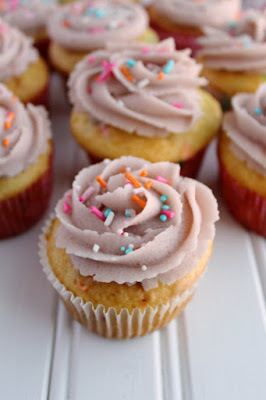 There are just so many fun frosting ideas out there and not enough time!! 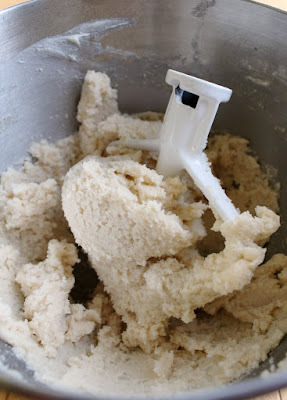 I had been toying with the idea of starting to make edible raw cookie dough. I know there are shops that sell it by the scoop, like an ice cream shop. In the meantime, I thought it would be fun to experiment a bit at home. There are a couple of keys to making edible cookie dough. The first is obviously the eggs. I am sure most of us have eaten raw cookie dough, eggs and all, and never gotten sick. The eggs in cookie dough help to bind the final baked cookie and sometimes offer a bit of rise. We need neither of those things when the dough is the final product, so it makes the most sense to leave the eggs out. That mitigates that risk. Flour is also a potential source of contamination. Now you can't exactly leave the flour out of the cookie dough and expect it to taste like dough... so we bake the flour first. A quick trip to the oven helps kill off any bacteria that may be present. You can certainly skip this step, but it is easy so it seems worth doing to be safe. Now you could easily eat this with a spoon and call it a day. OR..... you could use it as a frosting and but it on some cupcakes for that one two dessert punch! It is easy to make. After the flour has had a chance to cool down, you are ready to go. The flour obviously really gives it that cookie dough flavor. Also, instead of powdered sugar, you use granulated sugar to give it that slightly grainy feel you would get in a cookie dough. It isn't too sandy, but just enough to give you the right texture. Of course you need some vanilla in there. Luckily Adam's Extract sent some for #SpringSweetsWeek, so I was in good shape there. 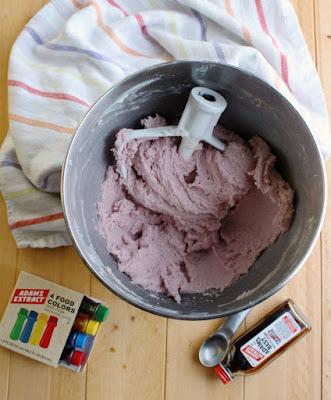 I thought it would be fun to make the frosting a lavender color for spring. I added a few drops each of Adam's natural red and blue food colorings. In hindsight, I wish I had used a few more drops. The color was pretty in person but definitely muted so it doesn't necessarily show as well as I would have liked in the pictures. Next time I'll get it right! On top I put the cutest Easter sprinkles from Sprinkle Pop. 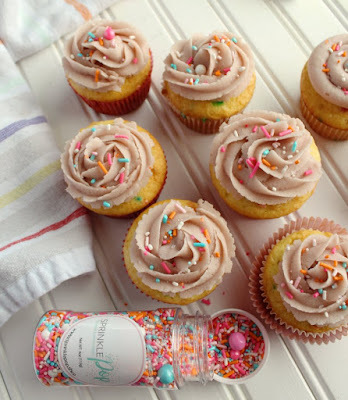 If you are a fan of sprinkles like we are, you have to check out their site! 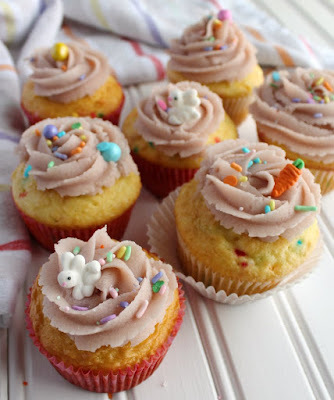 For these particular cupcakes I used Egg Hunt Sprinkle Mix with adorable bunnies and carrots. 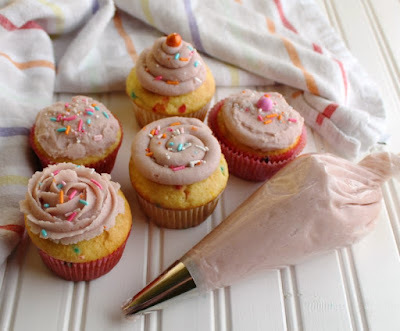 The Sorbeto mix also added a nice spring flare to the cupcakes. I have to say I really loved using the cookie dough as a frosting. I did loosen it up a bit more than I would if I had served it as a dough on its own. That helped make it a little easier to pipe. Otherwise the flavor and texture was spot on for sugar cookie dough! It was hard to not eat it right off the top of the cupcakes! Have you ever tried to make a food-safe cookie dough? What were your results? Also, what is your favorite kind of cookie dough? Don't forget to win the fabulous prizes from our sponsors. The disclaimers are at the bottom of this post and the info on the prizes is in the lemon crepe post I put up on Monday. Preheat oven to 350 F and line a rimmed baking sheet with parchment paper or a silicone mat. 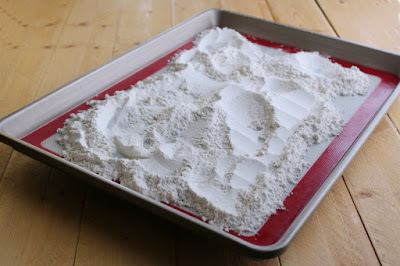 Spread flour over the prepared baking sheet. Bake for 7 minutes and then cool completely. In your mixer, beat the butter until it is soft and fluffy. Add the flour, sugar, vanilla, salt and a Tablespoon or two of milk. Beat for a couple of minutes. Add more milk if needed to get your desired consistency. Color if desired. Pipe or spread on cake or cookies. I bet this frosting is wonderful! Would be perfect on cupcakes for Easter! Such a unique flavor of frosting. I have to admit, the frosting is the favorite part of a cupcake for me. It's my favorite part too! I always fail at buttercreams. This one sounds delicious and perfect for filling macaron. We'll have to do a buttercream weekend sometime! What a wonderful, creative idea. I'm not much of a frosting fan but I'm a huge cookie dough fan. Then it's the perfect frosting for you!!! Ha! At least I can win one of you over ;-) Thank you! Oh my, this frosting sounds amazing! I could eat it with a spoon! Me too! It's so hard to stop! 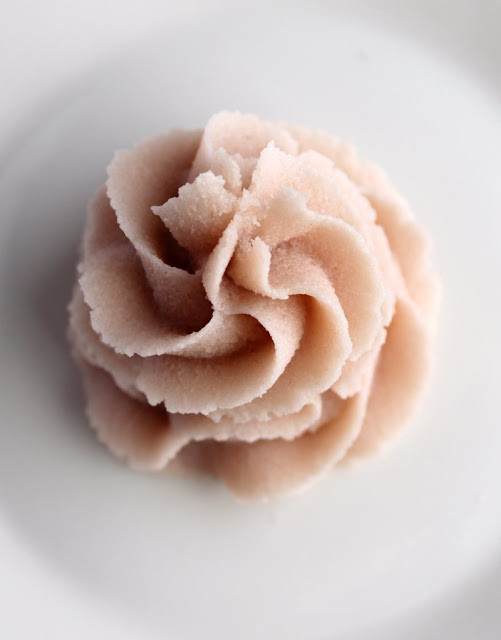 This is such a unique frosting recipe! It looks like it has a great texture, and love the colour! Thank you! It is a fun one for sure! Mmm! Sounds like some extra yummy frosting! I think this looks sooooo good! I love both and to have that flavor in a frosting...divine. I am definitely putting it in my regular rotation! It is so tempting to do just that! Thanks, Valentina! Genius! Imagine all the flavors for different cakes! Boosh! Mind blown! These cupcakes are adorable! I love how the frosting is cookie dough, and looks outstanding! It's a winner! 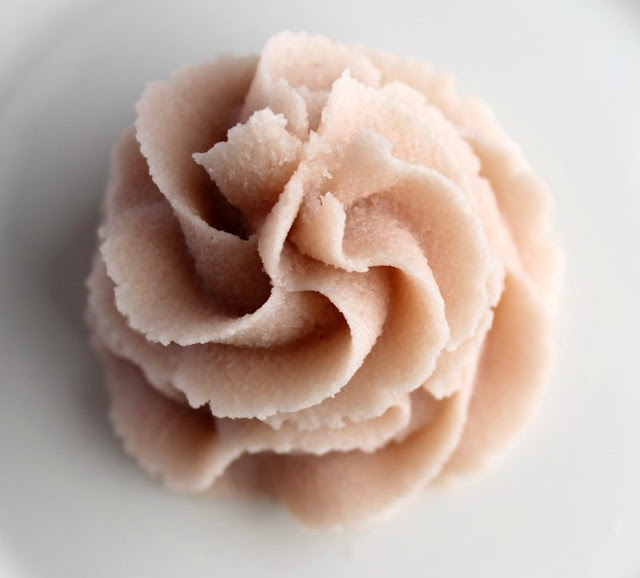 Sugar cookie dough frosting- you genius. This sounds out of this world yummy! Ha! I'll take it! Thank you! What a clever idea! I bet it tastes amazing! Just like real cookie dough! Oh yum! I need to make this soon! I love this idea, and I can't wait to give it a try! YUM!